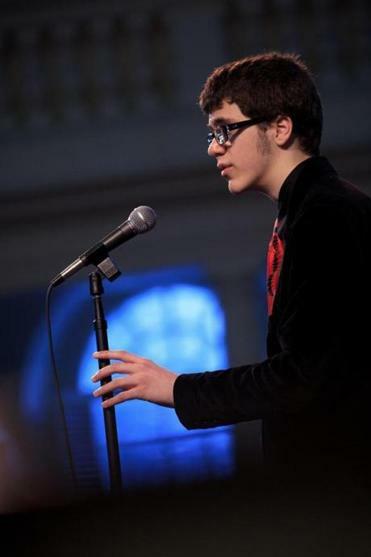 Nicholas Gilfor, a student at Wilbraham & Monson Academy, recited at Sunday’s Poetry Out Loud finals in Boston. Chelsea Rivera grew up in a world divided by words. At home, the 17-year-old spoke Spanish with her immigrant parents - her mother could not speak English. Outside, her words were English in an accent indiscernible from any other teen in New Bedford. But when she stood on stage Sunday in the Old South Meeting House for the seventh annual Poetry Out Loud competition hosted by the Huntington Theatre Company, she recited “Bilingual/Bilingüe,’’ a poem by Rhina Espaillat, fluidly switching between lines in English and Spanish. Rivera was one of 23 high school students selected from more than 20,000 statewide competitors to take the stage at the Meeting House and recite verse from memory. Alongside her fellow participants she gesticulated urgently as she stood before the microphone, her words echoing under the ancient eaves. The students sat in the front two pews, silently mouthing the words of the poems they had chosen as they nervously awaited their turn. But after brief introductions from MJ “Mwalim DaPhunkeeProfessor’’ Peters, a University of Massachusetts Dartmouth professor serving as an emcee and providing musical accompaniment from behind a grand piano, the competitors’ anxiety dissolved and they lost themselves in the sonnets and songs of William Shakespeare, John Donne, Elizabeth Bishop, and other bards. In the end, it was Stephanie Igharosa’s emotive rendition of “The Man With a Hoe’’ by Edwin Markham - the Randolph High School freshman’s favorite - that won over the judges, who named her the state champion. She will go on to compete in Washington, D.C., in May. “I felt like a different person; I became someone else,’’ Igharosa said after the judges crowned her with a small garland of ivy leaves. As she stood on stage to receive her award, grinning and standing straight in her gray suit and red blouse, Igharosa began to cry. “I’m just really excited,’’ she said. For the past seven years, the education wing of the Huntington Theatre Company has managed the statewide competition, which was formerly run by the Massachusetts Cultural Council. Nicholas Gilfor, 15, one of only two boys to compete, peered out at the audience from behind thick black-rimmed glasses as he performed “Monet Refuses the Operation’’ by Lisel Mueller, a fictional account of the esteemed French Impressionist resisting removal of the cataracts that inspired his distinct, blurry style.